The lifetime of this remarkable master known as Lao Tzu reportedly occurred between 570 to 490 B.C. Nothing of Lao Tzu is historically certain. He identified himself at the conscious level of my mind for the first time in my life in 1988 I was having brunch with some friends in Larkspur Landing, California. I was enjoying my friends; however, I had a sense of needing to be doing something else that became progressively stronger as our meal continued. I glanced across the way and saw a bookstore, A Clean Well-Lighted Place, and realized immediately what I needed to do. I excused myself after the bill was paid explaining I needed to go purchase a gift for a client. I purposefully walked into the bookstore and was greeted by a bookseller who asked what I needed. I announced, "I need to buy a book!" The bookseller inquired, "Do you know the title or the author?" "No. I'm sorry, I don't." "Do you know the category or subject matter?" "No....I'm sorry, I don't." Long pause. "I think it might be spiritual." Another pause - and a big smile, "I'll know it when I see it." The bookseller was wonderful and led me to the books on philosophy and spirituality. I felt the energy in the books on those shelves with the open palm of my right hand and through my upper chakras. It wasn't there. The bookseller was equanimous. He took me to the far back corner or the bookstore and asked, "How about here?" These books were purely spiritual. Again, I ran my open right palm along the spines of the books on the shelf. Suddenly, I stopped and smiled, "Here it is!" The slim volume was the Tao-Te-Ching translated by Stephen Mitchell. Merely holding it brought tears of joy to my eyes. In this lifetime, I had not read it - or even heard the name of of Lao Tzu - yet I felt such a strong affinity with his energy and the knowledge that waited for me in the translation of his writing. I bought the only three copies in the store. I gave one each to two of my clients; the third I kept for myself. I drove back to my home in San Francisco. I read the entire Tao-Te-Ching with gentle tears of joy coursing down my cheeks and a deep, comforting sense of coming home. And then I read it again...and again. For me, the beautiful message from Lao Tzu sent across time and space, as we think we know it, was to let go and let God (the Tao). He writes in the simplest of language about partnering with God. 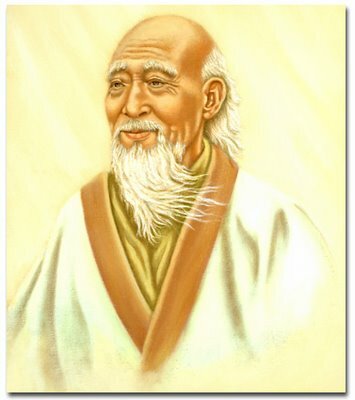 For me, it is not so much Lao Tzu's words as it is the energy that is carried by those words. The energy is peace. Deep, profound peace. I recognized that the energy of his presence had been with me from my earliest childhood and continues to this day, as has the energy of Christ and Saint Germain. For the blessing of that awareness, I am eternally grateful.